Tim was born outside of Baltimore, Maryland and shortly moved to North Eastern Pennsylvania where he lived all through high school and college. He attended Wyoming Seminary Preparatory school and played Lacrosse in the springtime and skied in the winter. (Often making trips out west to ski with his family in Colorado!) After graduating high school he went off to study Energy Business and Finance at the Pennsylvania State university. After graduating from college, Tim moved to upstate New York to pursue a career in renewable energy. 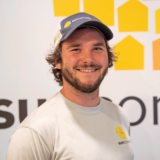 Working in the beginning from marketing and tabling events and talking with customers about their interest in solar, he realized that his passion for solar energy was immense. He decided to pursue more courses in Solar energy, online and through a local community college, in order to get some solar certifications and a better understand of the industry. After successfully becoming a NABCEP Associate and a NABCEP PV Technical sales professional, he took a month off to travel to Northern Ghana for an off-grid solar installation in the outskirts of Tamale. Shortly after returning from Ghana Tim was offered a change in roles – to a Site Surveyor position. This has allowed him to have a cross-departmental understand of solar energy and how it works on many levels. Over the last two years he has become FAA Part 107 certified and has developed a system to use a drone (sUAS) in the Site Evaluation process, which has drastically changed his role at the company. He is now a Site Survey engineer and Designer full time and is working on his final NABCEP Certification – PV Installation Professional.